The April 2019 exhibit at the Deming Art Center will feature Arizona artist Kelly LaMarr Boren. He grew up in Southeast Idaho and with the support of his mother and the tutelage of his art teacher, Kelly developed his creative abilities. At 12 he purchased a 35 mm “Focal” SLR camera and began shooting his own reflection in chrome hub caps, filling the frame with a single bee and taking multi-frame double exposures. He painted and drew his way through high school placing in a national drawing contest, joining the local art guild, exhibiting for the first time with encouragement from the “Red Barn Man” – Fred Ochi. He won the Helen Aupperle Scholarship and headed to Brigham Young University. He worked his way through school doing graphics on campus for $2.35 an hour. The winner of multiple student merit awards and scholarships and with a young family in tow he completed his Bachelor of Fine Arts degree. Kelly has continued to paint and exhibit in Utah, Alabama, Ohio and Washington. Finally, he has returned to his father’s humble beginnings in the warmth of Arizona. With the love and creative collaboration of his wife, Kelly has again picked up the brush, inspired by the open horizontal vistas and ancient mystery of the great Southwest. The show will run from March 31 – April 29, 2019. There will be an artist reception on Sunday, March 31, from 1-3PM at the Deming Art Center, located at 100 S Gold St., Deming, NM. For more information, please call 575-546-3663 or visit our FB page. The May 2018 exhibit at the Deming Art Center will feature our annual Luna County Fine Arts and Fine Arts &amp; Crafts Show. It showcases local artists and crafters in many different mediums including, painting, sculpture, fiber arts, jewelry and more. The show will be judged and prizes awarded. There will be an artist reception on Sunday, May 5, 2019 from 1-3PM. The exhibit will be up from May 2-29. The gallery is located at 100 S. Gold and regular hours are Mon-Sat 10AM-4PM. Please call 575-546-3663 or check our FB page for more information. Deming Art Center is looking for Artists for the June 2019 Fiber Arts Show. This show runs June 1-28, 2019 with intake on Friday, May 31, 2019, from 10AM-1PM. Entry fee is $25 for 1-3 pieces and the show will be judged and prizes awarded. Please call for more information at 575-546-3663 or see our Facebook page. For the March 2019 exhibit at the Deming Art Center we will be presenting works by Roy Van der Aa and Michael Pavao. Michael Pavao was born in Fall River, Massachusetts in 1944. He works in acrylic and watercolor, figurative and abstraction. He was a member of Will Barnet’s “Smoke Room Gang” at the Art Students League of New York in the 60’s and 70’s. He has shown extensively throughout the Northeast and the Southwest. He has resided in Las Cruces since 1996. All work is new for this show and the small format monotypes are dynamic and affordable. Pavao numbers rather than titles his work, incorporating the date of completion. Doing this avoids the preconceived imagery or meaning a formal title often suggests and suggests an affinity with music and mathematics where the form is counterbalanced by the space around the form. The feeling of improvisational jazz can be seen in the artwork. Roy van der Aa was born in Amsterdam, The Netherlands in 1956 and grew up in Montreal, Quebec, Canada. He immigrated to the U.S. in 1989. 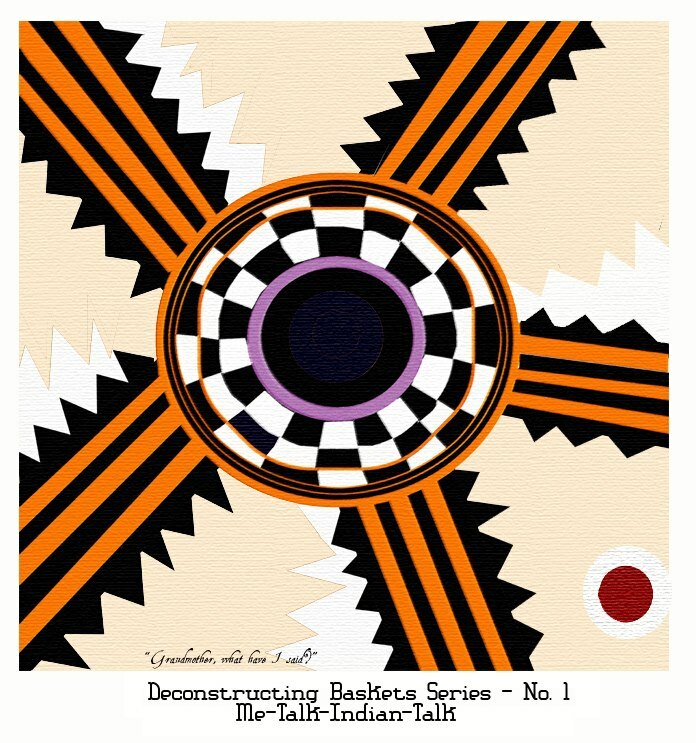 He works in mixed media in a non-objective style he calls Geometric Transcendence. Roy is a founding member of ArtForms and helps to organize the Love of Art Month held in February for the past 21 years in Las Cruces. He has had over 110 solo, 2 person and group shows beginning in 1978. He has also shown at the Cutter Gallery, Unsettled Gallery and Art Obscura in Las Cruces, Gallery 408 in Carrizozo and had two large shows at Rio Bravo Fine Art in Truth or Consequences. In 2018 has participated in shows at the Las Cruces Museum of Fine Art and The International Museum of Art in El Paso. In Europe he has been shown alongside graphic works by Chagall, Miro and Picasso. Mike and Roy have know each other for 10 years. This is their first show together. There will be an artist reception on Sunday, March 3, from 1-3PM. The Deming Art Center is located at 100 S. Gold St., Deming, NM. For more information please call 575-546-3663, or see our FB page. The February 2019 show at the Deming Art Center will feature artwork from Deming Junior High and High School students which will be on display February 2-14, 2019 at the Deming Art Center. There will be a reception for the students and the public on Saturday, February 2, from 1-3PM. On Monday February 18, 2019, the Deming Quilting club will have their quilts on display and for sale through February 27th. A reception for this event will be on Sunday, February 17, from 1-3 PM. Local country-western singer Bob Eller will provide music during the reception. The Deming Art Center is located at 100 S. Gold St., Deming, NM and is open Monday – Saturday, 10AM- 4PM. Please call 575-546-3663 or visit us on Facebook for more information. 3:45 – Hosana Eilert – Weaving ?? The annual Christmas Boutique happens December 1 through December 30. For more information contact the DAC. (546-3663) Artists’ receptopn will take place Sunday, December 2 from 1 to 3 PM. Display your artsy art for Santa to put under the Christmas Tree. Recycle Show - "Keep Luna County Beautiful"
November 2018 at the Deming Art Center is the annual Recycle Show which is sponsored by “Keep Luna County Beautiful.” Featured will be pieces of art made from 90% recycled materials, and crafted by artists of all ages. Intake will be Monday, October 29, 2018, from 10AM – 1PM. The show runs from October 30 – November 28. An Artist Reception will be held, Sunday, November 4, from 1-3 PM. The Deming Art Center is located at 100 S. Gold, Deming NM, and is open from 10AM-4PM Monday – Saturday. For more information call 575-546-3663 or see our FB page. The Black Range Artists will be the featured guests during the month of October 2018. Expect a diverse body of work on display. The show will run from October 2-24, 2018, with an artist reception on Sunday, October 7, from 1-3PM. Also in October is the bi-annual Guatemalan Mercado. It will be held on Friday, October 26, from 11-4, and Saturday, October 27, from 9-4. The center is located at 100 S. Gold St., in Deming, NM. Another event in October will the Artoberfest on Saturday, October 6, from 9AM-4PM at the Customs House in Deming. Come and meet local artists and view their work - all in one convenient location. For more information about all of these events, please call 575-546-3663 or visit us on Facebook. Fire and Fiber is the title of the August 2018 exhibit. This exhibit of visual art combines fired clay and fiber medium such as wool, cloth, paper, wood, or other fibrous materials into unique works of art. Each piece is the result of a special collaboration between a member of the Potter’s Guild of Las Cruces and a fiber artist from the southern New Mexico region. The show will run from August 2-30. An Artists Reception will be on Sunday, August 5, 1-3 pm. “Sci-Fi & Fantasy” is the theme for the July 2018 Exhibit at the Deming Art Center. It is an open show and will feature art mediums depicting Sci-Fi and Fantasy themes. Show intake is Friday, June 29 from 10AM-1PM. Local author Roxana Gillett will also be on hand to talk about and sign copies of her new book “The White Elephant Kneels”. The center is located at 100 S. Gold in Deming, NM. The hours are 10AM-5PM, Monday – Saturday, with a reception for the Artists on Sunday, July 1, from 1PM – 3PM. The show will run from July 1-30, 2018. Please call 575-546-3663, or check our FB page for more information. The June 2018 exhibit will once again feature the potters of Mata Ortiz from Chihuahua, Mexico. They will be bringing their work which will be on display and for sale from June 2-28. Mata Ortiz pottery is known and appreciated worldwide for its unique handpainted designs. The Deming Art Center is also please to introduce local artist, Steve McCluskey, a landscape painter, who will have his work on display. The Deming Art Center will host the Chamber First Friday on June 1, 2018 from 5 – 7 pm at the Center. The Artists Reception will be held also at this time instead of the usual Sunday afternoon time. The May 2018 exhibit at the Deming Art Center will be the annual Luna County Fine Arts and Fine Crafts Show. It features local artists and crafters showing in many different mediums including painting, sculpture, fiber arts, jewelry and more. There will be an artist reception on Sunday, May 6, 2018 from 1-3PM. The reception will also be showcasing Randy McCowan and Isabelle Lavon Blau, two local authors who will be doing signings with their current books. The exhibit will be up from May 1-30. The gallery is located at 100 S. Gold and regular hours are Mon-Sat 10AM-4PM. Please call 575-546-3663, check our FB page for more information. The Deming Art Center will feature the Fort Sill Apache Artists for a return show. This is a unique opportunity to see the fine arts created by the descendants of legendary Chiricahua and Warm Springs Apaches. The show will run from April 2-27, 2018. There will be an Artist Reception on Sunday, April 1, from 1-3PM. The Center is located at 100 S Gold and the hours are Monday – Saturday, 10AM-4PM. Please call 575-546-3663 or visit our FB page for more information. The annual Student Art Show will be the featured exhibit at the Deming Art Center in March 2018. The Elementary students will be exhibiting their art from the 1st – 14th, with an artist reception on Saturday, March 3rd from 1-3PM. The Intermediate, Middle School, High School will exhibit from the 15th – 30th with an artist reception on Saturday, March 17, from 1-3PM. ALSO- March 9, 10 & 11, 2018 the Deming Art Center will host the annual Quilting Bees Quilt Show. On the 10th there will be a trunk show and at 2PM the drawing for the raffle quilt. The Center hours for these events is 10-4PM Mon-Sat with the center being open on Sunday the 11th the same hours for the quilt show. The center is located a 100 S Gold St. For more information, please call 575-546-3663, visit our website at www.demingarts.org or see us on FB. The February 2018 show at the Deming Art Center will feature the San Vicente Artists or the SVA. San Vicente Artists was formed in the mid 1990's to promote the arts and artists in the Silver City/Grant County area. Through art shows, craft fairs, the Artist Guide, and a program to help youth artists, the organization proceeded to do what they set out to do - all arts and crafts have been represented by the SVA over the years and have been welcome. There will be an Artist reception at the Deming Art Center on Sunday, February 4, from 1-3PM. For more information please call 575-546-3663 or see our FB page. The Center is located at 100 S. Gold, Deming, NM and regular hours are Mon – Sat, 10AM-4PM. This will be the last scheduled show for the SVA. The group is going to take a break from all activities and are looking for new artists to be part of the organization. If you have any interest in becoming involved with the San Vicente Artists in the Silver City area, please contact either Libby Beck at nmsilverrain@yahoo.com , Arlene Sarkela at rasarkela@yahoo.com or David Mulvenna at studiogallery425@msn.com for information. “Braceros – Melding History and Art” opens Saturday, January 6 with a 1 p.m. oral presentation at the Deming Museum by Raymond Cobos. Local actors will portray the Mexican workers of the Braceros Program who supported U.S. agriculture and industry during the labor shortages of World War II. The actors will lead visitors to the Deming Arts Center for the visual segment of the exhibit. Sculptor Diana LeMarbe, painter Jeri Desrochers and woodworker Richard Boutwell will present this remarkable story in clay, paint and wood. The show continues through Saturday, January 30 at the Art Center. For more information contact Diana LeMarbe at 575-544-7708 or Jeri Desrochers at 575-640-9836 or jeri@jerisstudio.com. A Holiday Gift Boutique is the theme for December 2017 at the Deming Art Center. Come, browse, shop and find wonderful, unique gifts for family and friends this holiday season. The gallery is located at 100 S. Gold in Deming, NM and the hours are 10AM-4PM Monday – Saturday. The boutique will run from December 2-29 and there will be a reception for the artists & crafters on Sunday, December 3, from 1-3 PM. For more information call 575-546-3663, or see our Facebook page. November 2017 at the Deming Art Center is the annual Recycle Show which is sponsored by “Keep Luna County Beautiful.” Featured will be pieces of art made from 90% recycled materials, and crafted by artists of all ages. Intake will be Tuesday, October 30, 2017 and the show will run from November 1-29. An Artist Reception will be held, Sunday, November 5, from 1-3 PM. The Art Center is located at 100 S. Gold, Deming NM, and is open from 10AM-4PM Monday – Saturday. For more information call 575-546-3663, or see our FB page. The bi-annual Guatemalan Mercado is coming! It will be held on Friday, October 27, from 11-4, and Saturday, October 28, from 10-4. This is a very low-key venue for gift shopping. 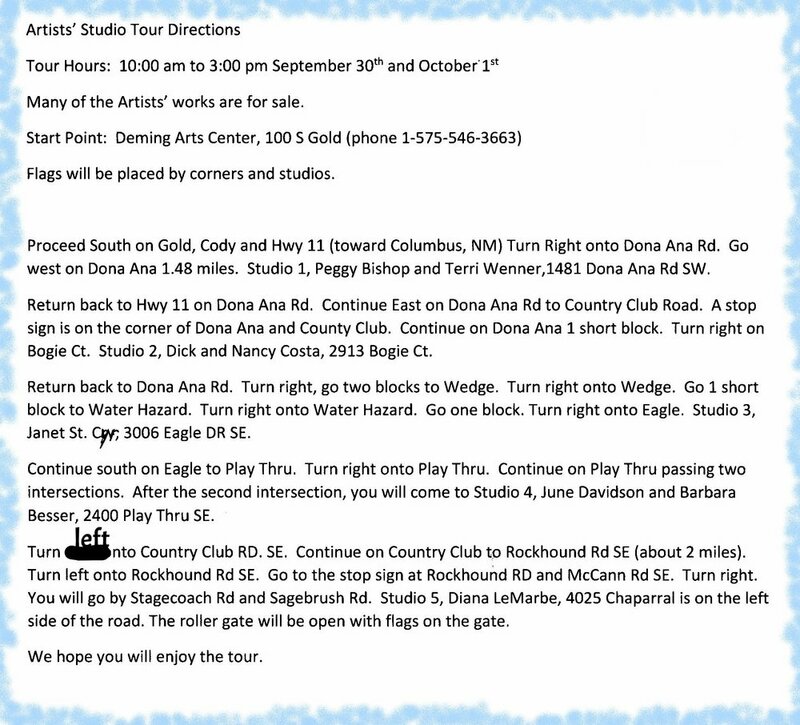 In October the Deming Art Center will host the Black Range Artists. Expect landscapes in a variety of media as many of the group's painters prize the land we live in. However, there are a number of Black Rangers who work with subjects and media which are not traditionally Southwestern so there will be a diverse body of work on display. The show will run from October 3-25, 2017, with an artist reception on Sunday, October 8, from 1-3PM. The center is located at 100 S. Gold St., in Deming, NM. For more information about all of these events, please call 575-546-3663, or visit us on Facebook. 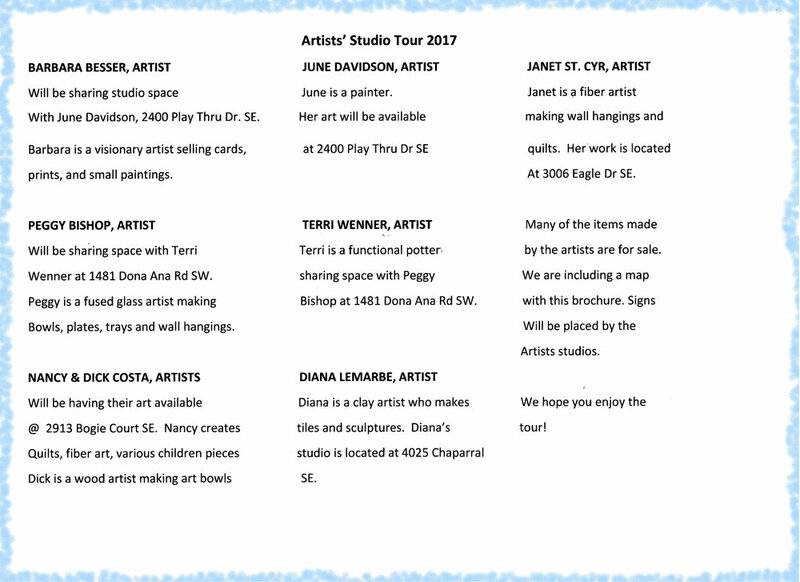 Shop for area artists' work where it's made! This two day event lasting from 10 AM to 3 PM September 30th and October 1st, has become an important tradition. Experience it and think about unique gifts that someone might appreciate. “States of Motion” is the title of the September 2017 exhibit at the Deming Art Center. Deming residents Brian Pottorff, multi-media, and Ron Wolfe, photography, are the featured artists. Ron has been an avid photographer since 2003. With his software background, he enjoys digitally developing an image as much as getting the initial good shot. Brian Pottorff has sculpted with a variety of materials for twenty three years, guided by geology, trees, Zen, mathematics, and random processes. He has shown the results in Arizona, New Mexico, and Texas. The exhibit will run from September 2-29 with an artist reception held Sunday, September 10, from 1-3PM. The gallery hours are from 10-4PM Monday-Saturday. For more information please call 575-546-3663 or see our Facebook page. “Creatures Large and Small” will be the theme of the August 2017 exhibit. This will be a juried show and open to all media. Reception is Sunday, August 6 and runs from August 1-30. “Airplanes & Balloons” is the title of the July 2017 Exhibit at the Deming Art Center. The International Cessna 170 Association, the largest airplane club of its kind in North America, is holding their annual convention in July in Deming and the Deming Art Center will be exhibiting flight related art. The center is located at 100 S. Gold in Deming, NM. The hours are 10AM-5PM, Monday – Saturday, with a reception for the Artists on Sunday, July 2, from 1PM – 3PM. The show will run from July 1-28, 2017. Eric Shonkwiler, writer, will be signing his books during the artist reception. ABOVE ALL MEN and 8th STREET POWER & LIGHT "...are literary novels with a bit of a thriller/western/noir bent". May at the Deming Art Center will present the annual Luna County Fine Arts and Fine Crafts Show. It features local artists and crafters showing in many different mediums including, painting, sculpture, fiber arts, jewelry and more. There will be an artist reception on Sunday, May 7, 2017 from 1-3PM. The gallery is located at 100 S. Gold and regular hours are Mon-Sat 10AM-4PM. Please call 575-546-3663, check our FB page for more information. 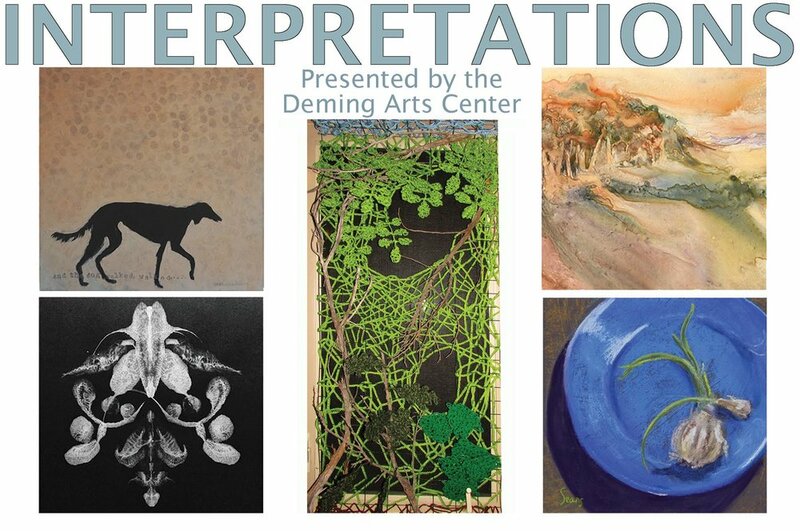 The April 2017 show at the Deming Art Center is entitled “INTERPRETATIONS” and is presented by a group of Hillsboro Artists. Each artist painted his or her interpretation of six different themes- tree, dog, poetry, decay, monotone or monochrome and pieces. The resulting body of work spans a variety of styles, visions, and mediums ranging from sculpture to collage and fiber art to paintings in watercolor, acrylics and pastel. It will all be on display from April 2-28, 2017 at the Gallery located at 100 S. Gold St. in Deming, NM. An artist reception will be held on Sunday, April 2, from 1-3PM. Regular hours are from 10AM-4PM Monday – Saturday. “Our goal was to challenge ourselves by trying new subjects and new techniques, and get out of our creative comfort zones,” says pastel artist Melody Sears. “And boy did we!” “This has been a year-long project for us,” says mixed media artist Nolan Winkler, “and I think we are all surprised with what we’ve created.” The artists contributing to INTERPRETATIONS are Jan Haley, Joanna Schaefer, Melody Sears, Jane Turner, and Nolan Winkler. The March Exhibit at the Deming Art Center is the annual Student Show. The Elementary students will be exhibiting their art from the 1st – 13th, with an artist reception on Saturday, March 4th from 1-3PM. The Intermediate, Middle School, High School and Cesar Chavez will exhibit from the 15th – 31st with an artist reception on Saturday, March 18, from 1-3PM. ALSO- March 10 & 11, 2017 is the Guatemalan Mercado- the main fund raiser for the Deming Art Center. Lots of unique gifts, clothing, jewelry and much more- come on by!! Deming native, David Vega Chavez, and Ralph Roybal of Santa Fe, will be the two featured artists for the Deming Art Center February 2017 show. Chavez, who was born in Deming, began drawing and painting in high school but eventually moved in another direction spending much of his early life involved in choreography, directing and dancing in the motion picture industry, television and the Las Vegas nightclub scene. In the early 90’s upon returning to New Mexico, he began painting seriously again and has never looked back. His favorite mediums are Watercolor, Acrylic and Egg Tempura and he enjoys painting the magic of the New Mexican light from sultry summer days to the cold, barren landscapes of northern New Mexico winters. David Vega Chavez currently resides in Albuquerque. Ralph Roybal began his career in bronze sculpting as an apprentice in some of the leading bronze foundries of the southwest. It was at Santa Fe Bronze under the famous sculptor Ernest Berke that Roybal realized his potential in bronze work. Much of his subject matter is based on 19th century North American tribes and tribal leaders with such notables like Geronimo, Black Hawk and Sitting Bull to name a few. He has won many first place awards in various Fine Art exhibitions and shows and can be found in the Permanent Collection of the Gilcrease Museum in Tulsa, OK. The show will run from Sunday, January 29 – February 24, with an artist reception on Sunday, January 29, 2017 from 1-3PM. The center is located at 100 S. Gold St., Deming, NM and is open Mon-Sat, 10AM - 4PM. Please see our Facebook pageor call 575-546-3663 for more information. In January the Deming Arts Center will feature the work of plein air artists. Plein air is painting done mostly or entirely outdoors and the time pressure on the painter results in a freer, looser style. The show runs from January 3 through January 26. Artists' reception Sunday the 8th from 1-3 at the Deming Arts Center at 100 S. Gold. The Center is open from 10AM-4PM Monday – Saturday. For more information call 575-546- 3663, or see our FaceBook page. Artists: Intake- Monday, January 2, 2017 Take Down- Friday, January 27, 2017. The Deming Arts Center presents a Holiday Gift Boutique for December 2016. Come, browse, shop and find wonderful, unique gifts for family and friends this holiday season. The gallery is located at 100 S. Gold in Deming, NM and the hours are 10AM-4PM Monday – Saturday. The boutique will run from December 2-29 and there will be a reception for the artists & crafters on Sunday, December 4, from 1-3 PM. For more information call 575-546-3663, or see our Facebook page.